This week, Echo buttons have been opened up to be able to trigger whole routines, Dominos Australia have an app to preview your pizza in AR, Xinhua in China has a new AI news anchor, Alexa came to Windows 10, Black Friday deals are coming and so much more! 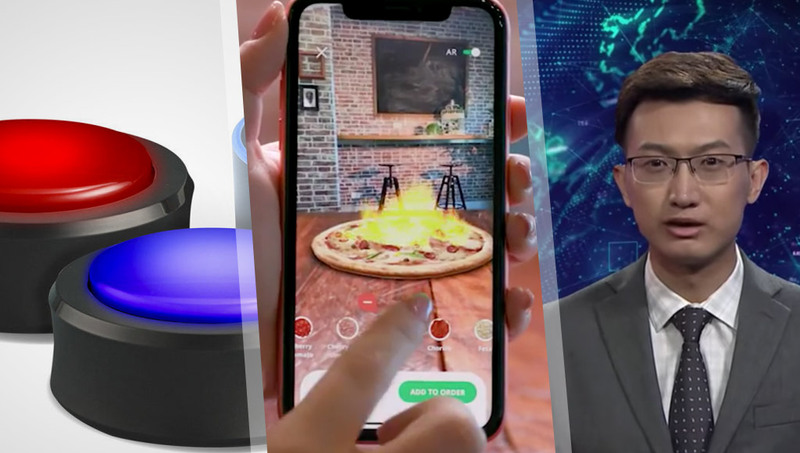 Echo’s buttons, augmented reality pizza from Domino’s and China’s new AI news anchor! Looking for a cheaper VM? Mjenzi Cloud has an enterprise-grade IaaS cloud services platform that will power your cloud journey quickly, efficiently and affordably with data centres in Australia as well as the east and west coast of the US. If interested, get in touch with cloud@mjenzi.com and let em know you heard about it from Dev Diner! Nadja Haldimann talks about how she approached working with Mozilla on their new Firefox Reality browser. Valve might be releasing a new VR headset soon with new Knuckles controllers and a potential Half-Life tie in. If you’ve been waiting to watch YouTube in VR on your Oculus Go — wait no more! Refer a friend to get an Oculus headset — you get credit and they get a discount! Then you both can watch YouTube VR. David Jagneux tried out Vive Sync, a professional collaboration platform, and focused on how well the controllers performed (he was impressed!). Steve Bambury talks about making apps for education. If you’re in the San Fran area, join in the fun! Apparently, a pirate theme is involved? “Google may one day make our virtual avatars more expressive by tracking our eyes thanks to a patent for using cameras to track eyes in VR”. The director of ‘Black Swan’ talks about his new VR series that he produced called ‘Spheres’. VRFocus explores “what the deal is with all these virtual dating simulators, and why they are so awkward”. If you create an AR/VR app using Sumerian for this challenge, you could potentially win some solid prizes! “The immersive education platform offers students in-depth surgical simulations complete with real-time feedback”. I gave my thoughts on The Unreal Garden, a new art space in San Fran, and interviewed Leila Amirsadeghi, Onedome CMO about it all! It was very cool. Aryzon, the Google Cardboard-style AR headset, has a new app that lets you look at 3D models from Sketchfab and Google Poly. It’s a neat way of controlling AR characters without needing a joystick or thumb controller. VentureBeat had a transcription of a group interview a bunch of press had with their team. Slowly but surely we’ll have AR glasses from Apple it appears! After their first two batches of videos from their L.E.A.P. developer conference, we’ve got a few more up now! Samsung introduced their AR cloud and a partnership with Wacom that turns Samsung’s S-Pen into an AR magic wand. Unreal Engine’s support for building for augmented reality is definitely improving and is worth checking out! I’m incredibly proud that Australia is leading the way in augmented reality pizza. It is only US$29.99 and curiously has a main module that pops out of the wrist band and attaches to a clip that you can put on your shoe. If you’re wondering what an AI news anchor would be like, here’s your answer! China has one right here! If someone asks why they’d ever need a connected car, you just show them this video. IEEE Spectrum put together a list of the world’s creepiest robots, top rated robots and most wanted robots. “Google researchers have open-sourced an AI system that can suss out speakers with state-of-the-art accuracy compared to previous methods”. I really like this headline from The Inquirer, it’s incredibly accurate. Machine learning could help detect fires early according to Futurism — but only if everyone can work together to share info. I absolutely LOVE these sorts of solutions, the home literally comes alive and moves around. So very cool. Hackaday has a link to a list that Victoria, a keen AI enthusiast, put together of all the times AI did exactly what it was told but not quite what we’d hoped. In 2019, 10% of companies will bring human expertise back into the AI loop — that’s totally okay as everyone experiments with what AI is best at. Wired has a guide for those keen to get their hands on Google assistant powered smart speakers. “Your AI startup needs lots of data to train your model. But the costs of that data can eat away at your business. Here’s how to predict and optimize on those costs to improve your path to growth”. Assistants like Bixby, Siri, and Alexa need devs to help inspire the future of conversational computing. It’s almost like you should sign up and check out my Dialogflow early access course (soon to turn into an e-book instead)! With more developers exploring this area though, we’ll find that voice assistants and conversational interfaces find their way. I quite like this idea but… what if you’re opening up some late night shipments and your family are all asleep? Apparently, “students aged 18 and younger will research and build lethal weapon systems”. Walmart is launching an “Intelligent Retail Lab” to test out both associate and customer AI-powered experiences. “Today, Google Cloud announced Kubeflow pipelines and AI Hub, two tools designed to help data scientists put to work across their organizations the models they create”. This AI can apparently work out restaurants likely to fail a health inspection. My stomach shall be forever grateful. Black Friday is almost here — CNet has a fantastic list of all the deals on their way! Alexa can be downloaded on Windows today in the UK, US and Germany, with other countries to come in 2019. The buttons can now be more than just game controllers, they can now trigger Alexa commands — plenty of IoT/maker potential here. There are multiple ways of auto-starting programs on the Raspberry Pi when it boots or you log in. The latest version of Raspbian includes a new one — ‘systemd’. Make have a solid review of the Arduino MKR WiFi 1010! Apparently, you can also set the temperature and start the defroster using your voice. This Particle-powered project alerts you when to stop and turns on a “porch light” when you head into your parking spot!